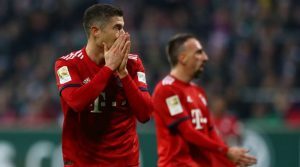 Bayern and Nurnberg play out on Saturday afternoon in Munich concerning the 14th Bundesliga Matchday. Bayern remain in 4th place in the German championship with 24 points, with 7 wins, 3 draws and 3 losses. His goal ratio has 25 scored and 18 conceded, making an average of 3.3 goals per game. His home performance has been the least productive, adding just two wins in the six games in front of his audience. The Bavarian team arrives after winning the last 2 matches. Nurnberg ranked 15th in the Bundesliga with 11 points, with 2 wins, 5 draws and 6 losses. In terms of goals scored 14 scored and 30 conceded, averaging 3.4 goals per game. Its foreign performance has been very weak, adding only 2 points in the 6 rounds as a visitor. The team is in a negative phase, not registering any victory in the last eight matches. I think the odd for Bayern to win at half-time and to score more than 2.5 goals is too high for what I expect from the game. The Bavarians must register here a fat triumph and begin to build it in the first part. The opponents are very fragile, they present the most defensive defense of the league and will have many difficulties to stop the Bayern attack. Recall that this Nurnberg suffered 5 in the visit to Leipzig, 7 more in the displacement to Dortmund and still 5 in the redoubt of Schalke.